In 1985, four Fianna Fáil TDs left the party in protest over Charles Haughey's leadership and, along with Fine Gael TD Michael McDowell, founded a new political party, the Progressive Democrats. The new five seat-strong party marked itself out as Ireland's first liberal party, both socially and economically. There certainly was a gap for such a party to emerge, but whether that gap would translate into a niche within Irish political culture was far less certain. In their first election two years after their formation, the PDs did quite well, securing 14 seats and displacing the Labour Party as the third largest party in the Dáil. The party served the resulting term in Opposition, although their novelty had worn off by the next general election in 1989. They lost 8 seats and 6.4% of the vote, but still held strong with 6 seats in the Dáil. It was after this election that the party made the controversial decision to support Fianna Fáil - still led by Haughey - in government. It was the beginning of a pattern for both parties. 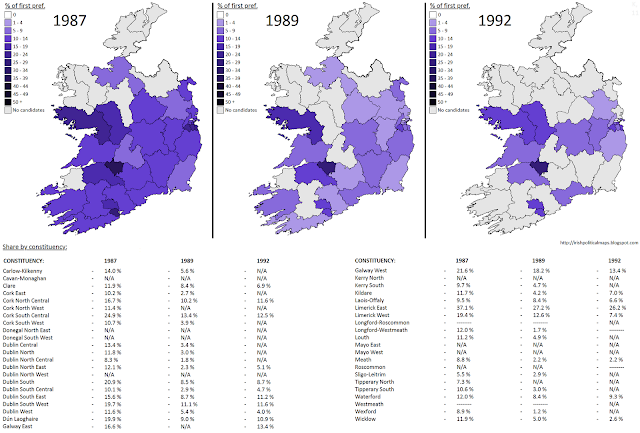 The 1992 general election saw their seat share increase, bringing them up to 10, though the party ran fewer candidates than in their previous two elections and secured strong support in only three areas - south Dublin, Galway, urban Cork, and Limerick East. These successes were due to established names such as Bobby Molloy (Galway West) and Mary Harney (Dublin South West). The party's best results during the period 1987 - 1992 were in Limerick East, where leader Desmond O'Malley was based. Each of these names were former Fianna Fáil TDs, and could count on the personal support they had always received. Outside of these areas, the party's new faces could not count on such support and so the party did not fare so well. It seemed that while there was indeed a gap for an Irish liberal party, the niche was not quite there yet. A greyscale version will be added shortly.